Earlier this year we lost an important person from our local trail / ultra family to cancer – a week out from this years Superior 100 he is in the thoughts of many of the runners & volunteers that will be at the race. In 2014 Aaron Buffington (pictured right) made it to one last Superior 100 before passing the following February. Aaron was accompanied by his brother Jason (pictured left), they volunteered and supported other runners… their friends, it was truly great having Aaron there. 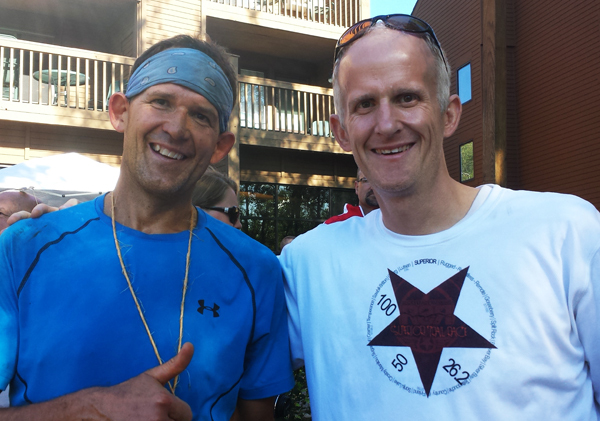 Aaron completed the Superior 100 in 2011, 2012 and 2013 – in 2012 he completed the Gnarly Bandit Ultra Series – his brother Jason also finished the 100 in 2013. Jason will be back at the race this year volunteering at the Finland Aid Station and at the finish line as a race MD. All of the running stuff aside, Aaron was just a wonderful human being – he is deeply missed by so many. Running trails / ultras is not a cure-all for all of life’s woes, it is not the measure of a man or woman but it can be a spiritual experience especially when we engage in it together with the right intention and in the right spirit – above all we value the relationships that have been made over the years – everything else (finishes, places, buckles etc.) is just icing on the cake. Please carry this sentiment in your hearts as you make final preperations and travel this coming week and please, once you arrive be sure to meet some new folks and share a piece of yourself and remember how lucky we all are – this is not about any one individual, it is not about “me” and “my race” it is about “US” and that is what sets us apart and that is why we hold it so close.